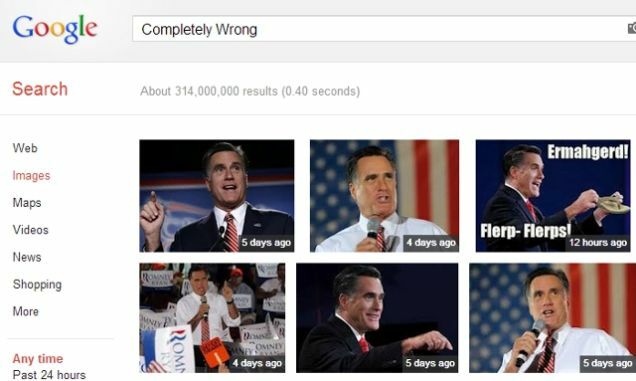 It came to the Internet's attention this morning that searching on the phrase "completely wrong" in Google's Image Search turned up dozens of photos of GOP presidential nominee Mitt Romney. 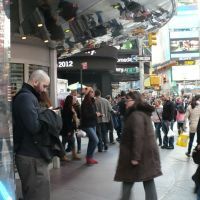 Much amusement was had by most. But, unlike previous pairings of politicians and negative search terms, this one seems to have been the candidate's own doing. In his retraction of the now-infamous "47 percent remarks," Romney told Fox News host Sean Hannity he was "just completely wrong." When media outlets (including this one) ran the story, they featured the quote prominently in their headlines. Thus, it seems, Google's algorithm unwittingly "tagged" multiple images of Romney with the words "completely wrong," and a meme was born. "Completely Wrong" has since shot up to number three on Google's Hot Trends list, ensuring the Romney's "Google Problem" sticks around — at least until Google pulls the plug on fun.